4) that the marriage to Santa Rosa White was his “first”. This conflicting information makes it seem that there are two distinct men named Cornelius McMillan. Santa Rosa White entered a 2nd marriage on 19 May 1892 at Evansville, VandenBurgh, Indiana, a man named Perry Campbell. Her widow’s pension application is part of the same pension package for Cornelius. She evidently presumed Cornelius to have died in Ohio, but that proved not to be the case as we’ll soon see. 3) that he is the identical Cornelius McMillan was was a private in Captain Brown’s Company J, 12th Regiment, Michigan Infantry Brigade who was honorably discharged at Cincinnati, Ohio on the 4th day of September 1862. Imagine Santy’s surprise to discover Cornelius was still living! But why would she believe him to be dead? Why did he leave in the first place? From what I can discover Santy (his wife) never went to San Francisco, California. Was this another lie told the Reone[?] family of Benton Harbor? A later 1893 inquiry was made to determine whether Cornelius was then dead. This was confirmed to be true. Below is his obituary dated 8 March 1892, the day of his death. 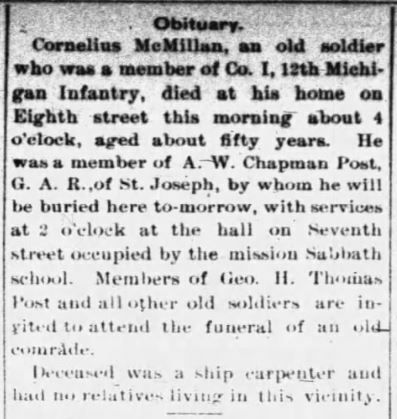 1) Cornelius McMillan died on 8 March 1892 at his home on 8th Street in Benton Harbor. 2) He was a member of the A W Chapman Post GAR of St. Joseph: the veteran organization that buried him. Services were held at the hall on 7th Street occupied by the mission Sabbath school. 3) Specifies that Cornelius was a ship carpenter. 4) He had no relatives living in the vicinity. 5) Was presumably buried in Benton Harbor. Unmarked grave? Now that it is confirmed that the Cornelius McMillan who was married to Fanny Dart, who was the soldier assigned to the 12th Michigan Infantry, and who was married to Santa Rosa White was in fact one and the same person, what became of Fanny and the children they shared? Rolling back the years to the time they were together, since Cornelius and Fanny were wed on 4 August 1861 in Berrien County, Michigan, the first census on which they would appear as a couple is the 1870 US. And here we find them with sons, John, Edward and Edgar. Cornelius (Neal) was in Lincoln Township (and Niles) around 1870. These were boating towns connected to the St. Joseph River where formerly boats were used to transport goods prior to the development of the railroad. Neal was an essential part of this. The 1870 Census does not show an occupation for Neal which is as it should be seeing how he was now an invalid with a war-related spinal injury. He probably couldn’t work. He was receiving government pension. 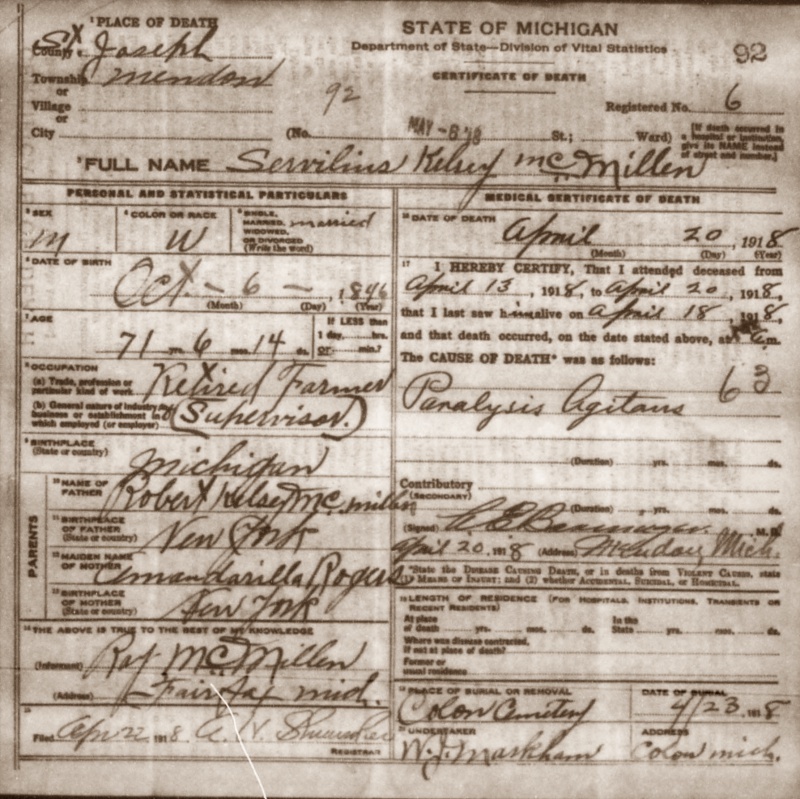 No other McMillan’s are found on the Lincoln Township Census. 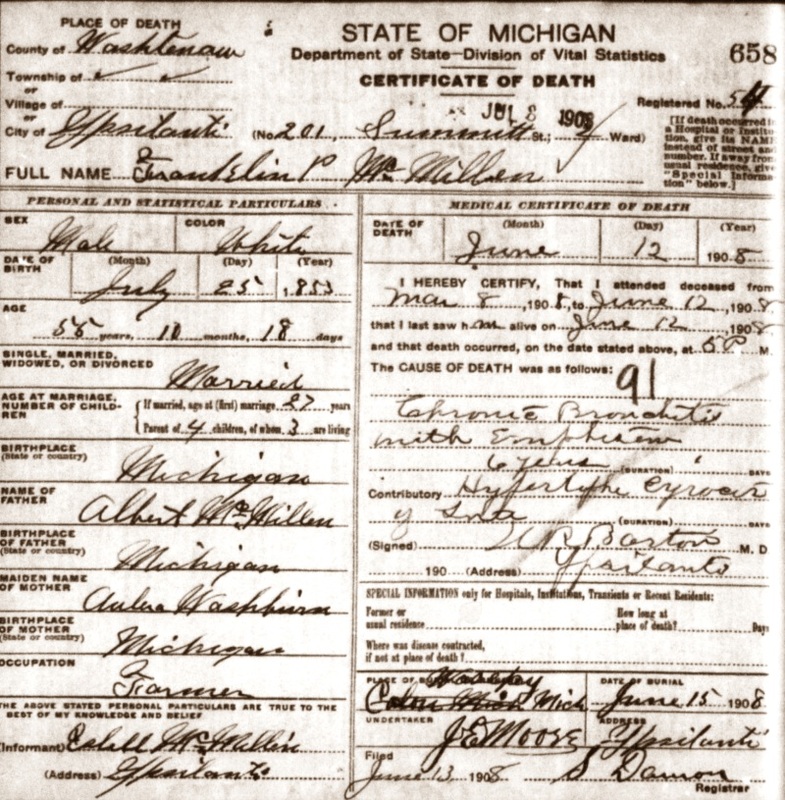 “Michigan Deaths, 1867-1897,” database with images, FamilySearch (https://familysearch.org/ark:/61903/1:1:N3DP-Z5Z : 10 March 2018), Anna Mc Millan, 07 May 1869; citing p 53 rn 94, Niles, Berrien, Michigan, Department of Vital Records, Lansing; FHL microfilm 2,363,448. 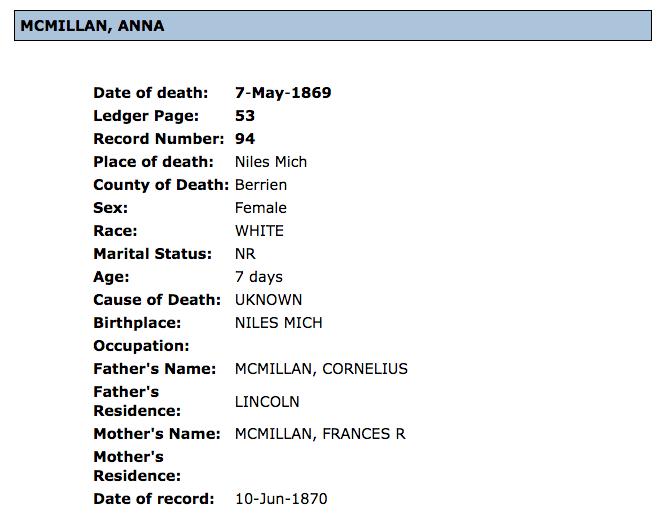 Michigan GENDIS (Genealogical Death Indexing System) that encompasses deaths from 1867 to 1897 do not show either of these children while it does Anna who died in 1869. Missing from the above 1870 Census is a daughter named Anna who died at 7 days old on 7 May 1869 in Niles, Michigan from unknown causes. It is not known the date of Fanny’s death nor the place of her burial. That is yet to be determined. However, rolling forward to the 1880 US Census we find evidence that her three sons were living in Ohio, Edgar with her younger sister Sophronia (Safrona) Dart in Auglaize, Paulding, Ohio. Cornelius is notably absent. The 1880 Census clip above is taken from the Auglaize, Paulding, Ohio census. 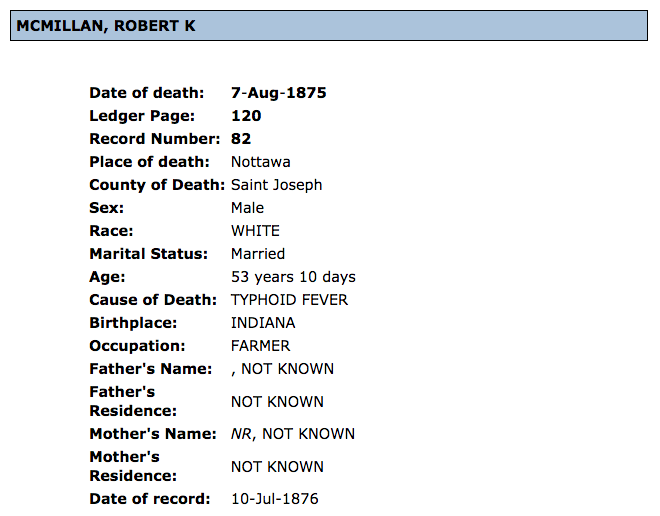 Note the census shows Edgar McMillen, age 15, living with Safrona Dart, age 26. The question begs to be asked? Who is Safrona Dart? Note that “D” in the 5th column: that stands for Divorced. Safrona calls Edgar her “son”. Was this a clerical error? 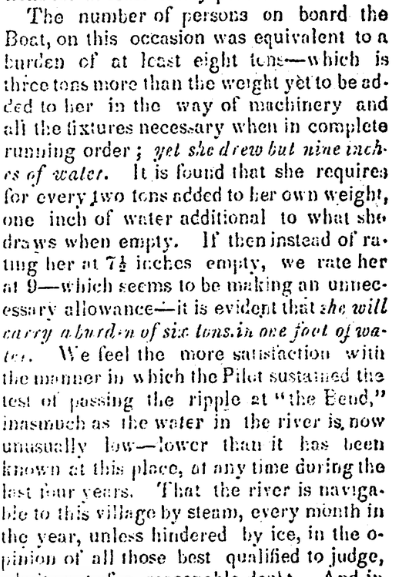 Was Safrona Fanny’s sister? The answer is found on the 1850 Census for Randolph, Cattaraugus, New York, for the Curtis Dart family. Curtis was Fanny Dart’s father. Sophronia was just 1 on the 1850 census (born 1849). If 26 in 1880 she would have been born around 1854. Ages were often estimated on census reports. It is extremely likely that Safrona was Sophronia, Fanny’s younger sister. Could Cornelius have married Sophronia after the death of Fanny? I have found no evidence to confirm this. Rather, the divorce was from the other son stated, William Harvey’s father, not from Cornelius. Edgar may have been mistaken as hers during the census reading. Or she may have taken him in and accepted him as her own. 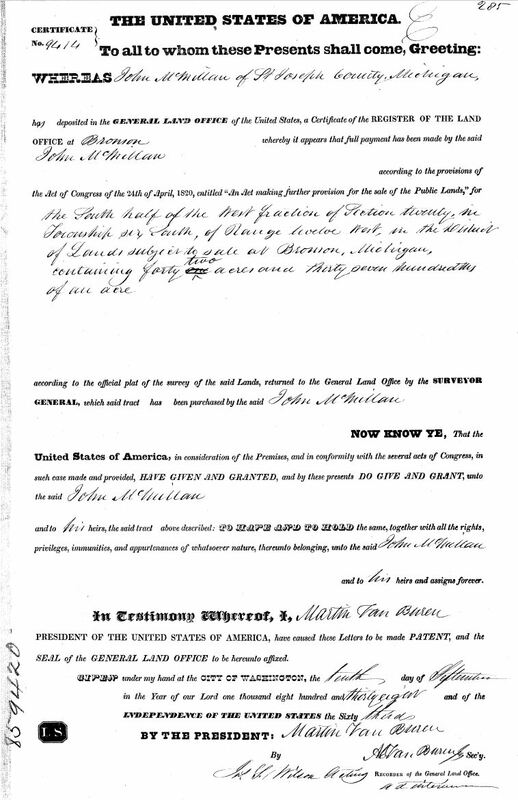 “United States Census, 1850,” database with images, FamilySearch (https://familysearch.org/ark:/61903/1:1:MCTV-PX8 : 12 April 2016), Curtis Dart, Randolph, Cattaraugus, New York, United States; citing family 22, NARA microfilm publication M432 (Washington, D.C.: National Archives and Records Administration, n.d.). Where were Edward and John? In the same 1880 Auglaize, Paulding, Ohio census that featured Safrona and Edgar McMillan, is also found John McMullen, noted as being about age 16, a laborer, living under the Joseph Mansfield household. This is likely Edgar’s older brother John. “United States Census, 1880,” database with images, FamilySearch (https://familysearch.org/ark:/61903/1:1:M8SZ-RJC : 12 August 2017), John Mc Mullen in household of Joseph Mansfield, Auglaize, Paulding, Ohio, United States; citing enumeration district ED 124, sheet 539A, NARA microfilm publication T9 (Washington D.C.: National Archives and Records Administration, n.d.), roll 1056; FHL microfilm 1,255,056. Sophrona L. Dart was in Niles, Berrien County, Michigan in 1860. She was then 11. This places here at or near where her sister would have died. Sophronia L. Dart remarried Charles Schooley on 15 September 1880 (after the 1880 Census was taken) in Defiance, Ohio. 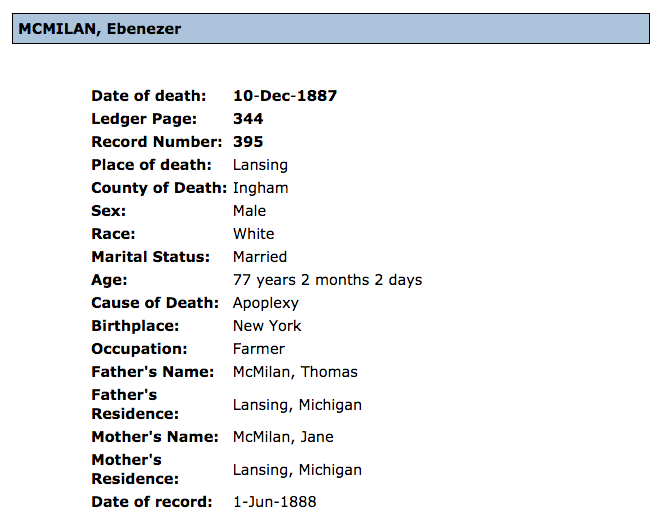 Incidentally, this is how both John and Edgar McMellen came to be in Paulding County, Ohio and why Edgar James McMellen, son of Edgar Joseph, was born there. It is known that Edgar’s twin Edward was also there as his daughter Lina was born in Blue Creek, Paulding, Ohio in 1892. “Ohio Births and Christenings, 1821-1962,” database, FamilySearch(https://familysearch.org/ark:/61903/1:1:XDYH-9VC : 11 February 2018), E.J. 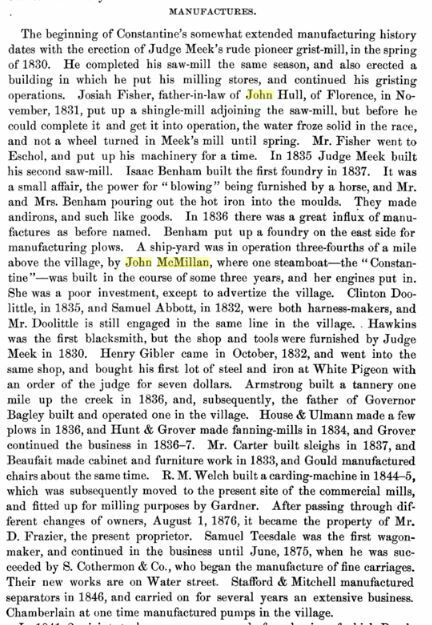 Mcmellon in entry for Lina G. Mcmellon, 08 Mar 1892; citing Blue Creek, Paulding, Ohio, reference ; FHL microfilm 925,298. 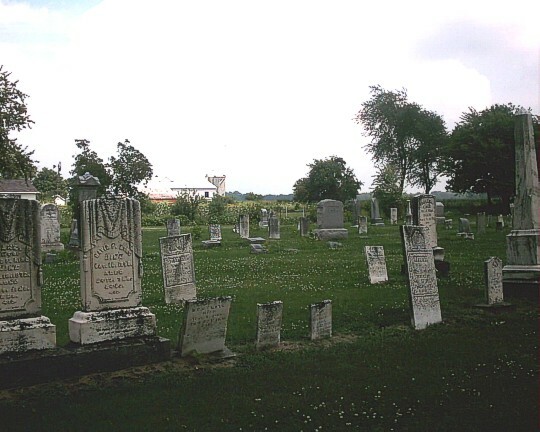 This places all three sons in Paulding County, Ohio during the 1880s after the death of their mother Fanny. Returning to Cornelius. Where was he in 1880? Apparently in Illinois where he married Santa Rosa White, daughter of Marcus and Nancy White on 13 August 1881. The record states that she was just 20. He likely lied about his age saying he was 31 when in reality he was close to 50. The couple were married by John Crozier, Pastor of the Presbyterian Church in Olney, Illinois. “Illinois, County Marriages, 1810-1940,” database, FamilySearch(https://familysearch.org/ark:/61903/1:1:QK92-TFYD : 18 October 2017), Cornelias Mcmuellan and Santa Rosa White, 13 Aug 1881; citing Richland, Illinois, United States, county offices, Illinois; FHL microfilm 1,221,093. Did Cornelius and Santa Rosa have any children together? Yes. The affidavit further declares that Cornelius left his widow and invalid child nothing by way of property or money. Santy Rosa’s notarized Declaration for Widow’s Pension states that Ethel[?] E. McMillan was born 5 January 1880. A later letter dated 6 March 1911 confirms the (1) living daughter named Effie Elizabeth born 5 January 1882. Based on the above information, it does appear that Cornelius McMillan and Santy Rosa White did have two children together, the first, Francis Della born 13 November 1884 (having died before 1891), and the second, Etha Zebda McMillan, a deaf mute, who was likely born 5 January 1888 and still living in 1911. Is it possible then that Cornelius McMillan abandoned his young family? For whatever reason Rosa believed that Cornelius had gone to Saugatuck, Michigan and later died in Cleveland, Ohio. Neither appear to be the truth. It is an odd situation to be certain. Returning to Cornelius’ Declaration of Original Pension dated 21 October 1872 at Paulding, Paulding, Ohio, there is a physical description of Cornelius. He was then 36 years old (born 1836), stood at 5 feet 8 inches tall, was of light complexion, had light hair (blond? ), and blue eyes. Cornelius was alive in 1890 to complete the 1890 Census Veterans Schedule. Cornelius McMillan [sic]; Private; Company J; 12th Michigan Infantry; enlisted October 1861; discharged October 1862; served 1 year; post office – Stevensville, Berrien Co, Michigan; disability incurred: injured spine; remarks – discharged for disability. Digitized history “Record Twelfth Michigan Infantry Civil War 1861-1865” available for viewing here contained the following. At age 27 Cornelius McMillan enlisted with the 12th Michigan Infantry and was assigned to Company “C”. A soldier assigned to Company “J” wished to be transferred to “C” on account of his brother being a part of that unit so Cornelius volunteered to switch companies. Cornelius enlisted for 3 years but only served 1 on account of an injury received at the Battle of Shiloh in April 1862. Below are unit muster reports for Cornelius time in service. 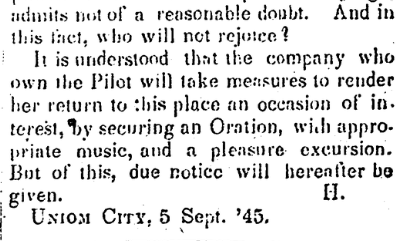 Note Cornelius absence from his company in May/June of 1862, this being after the April 1862 battle. Note also that the muster report is in error stating that Cornelius died from disease while AWOL. 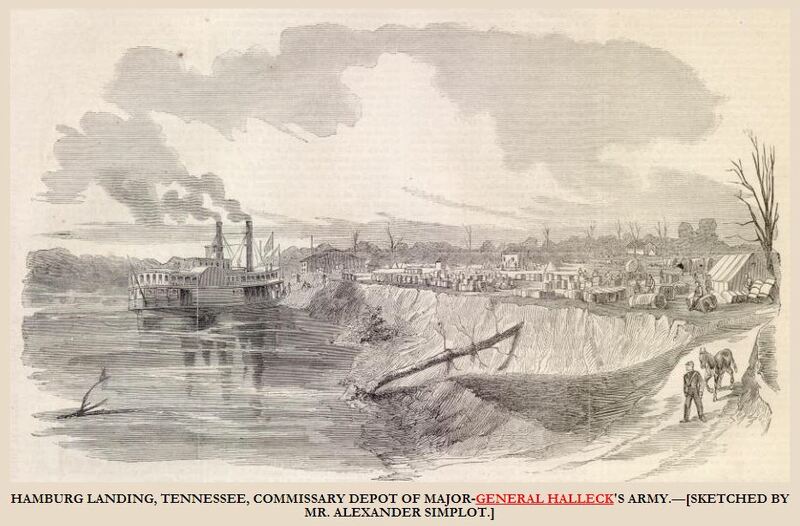 The transfer to Company “J” allegedly took place on 1 September 1862 but all company books were lost at the Battle of Shiloh thus causing a great amount of confusion that would ultimately delay Cornelius from obtaining his pension. This information is collaborated by Cornelius’ Pension Request below. 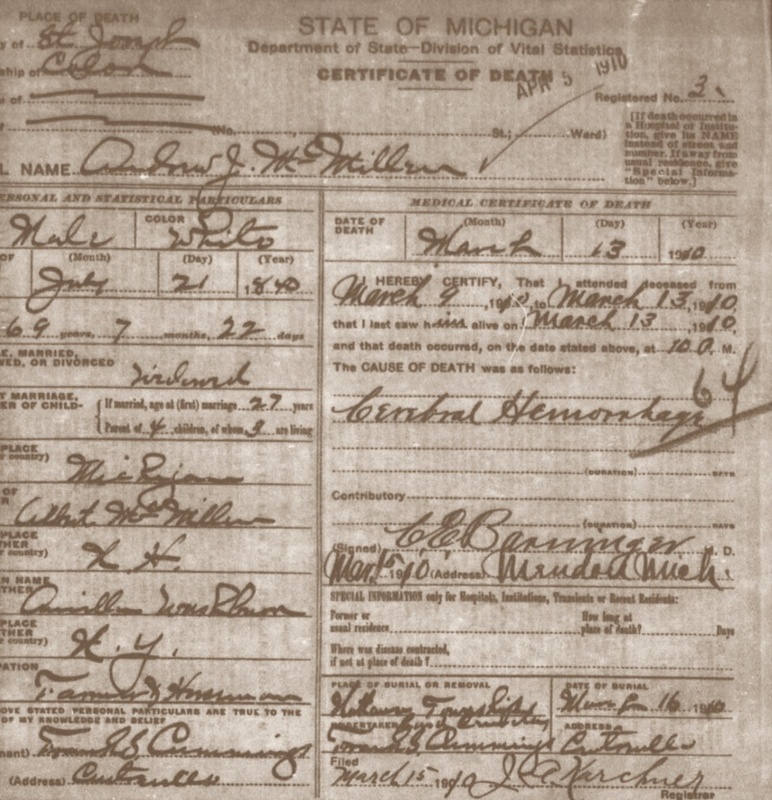 Cornelius McMellen of the 12th Michigan Infantry, Co. “C” did apply for an invalid pension (no. 27648) on 30 June 1863 and his wife Santy R. later for a widow’s pension (no. 441464 on 19 July 1890. His widow applied from Indiana. 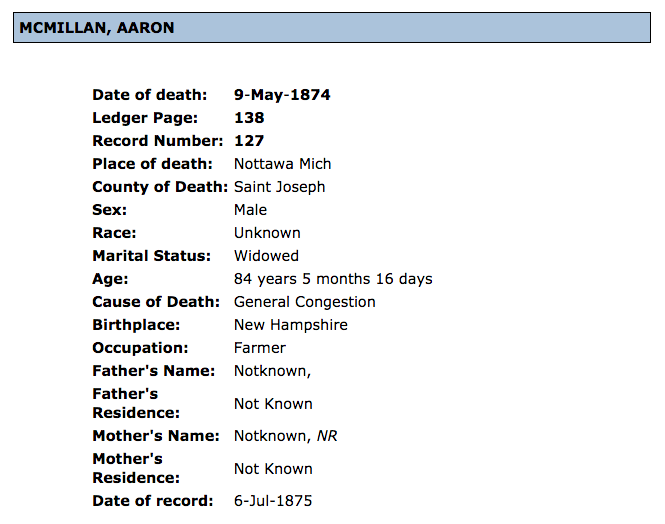 I manually searched the “Michigan Deaths, 1867-1897” unindexed collection on FamilySearch for Berrien County in the years 1889 and 1890 but did not find Cornelius listed as having died there. The doctor examined his person and signed a Surgeon’s Certificate. His pulse was 75; respiration 18; temperature 98.5. He then stood 5 feet 6 inches tall and weighed in at 125 pounds. His age: 67. Doctor wrote, “there is a slight scar on anterior surface of chest 1-1.5 inch in diameter, not tender or adherent and situated 2 inches below and to right of upper extremity of sternum. This applicant states [it] is result of injury to chest. There is no depressions or irregularity of the ribs over any portions of the chest indicating former injury and no external marks except scar above noted. We find no dullness on percussion over any portion of the chest, and vocal resonance is normal. There is a severe rheumatic condition afflicting most of the joints of body, worst at present in both hips, both shoulders and left elbow. There is much creaking of knees and shoulders on motion and motion of these joints is much impaired, motion of both knees 1/2, hips 3/4, and shoulders 1/2 impaired. Both arms cannot be raised above a horizontal position. Left forearm cannot be extended by 30 deg. and attempts at forced motion of their joints causes severe pain. Fingers of both hands are quite stiff and grasping power of both hands is 3/4 lost. Muscles of right side of chest are quite sore and painful on pressure. There is a narrow indistinct scar 1 1/4 inch long by 1/16 inch wide situated on outer surface of left wrist over lower extremity of radius. This is quite tender on pressure. So what did happen to Cornelius and where did it happen? “says he is 67 years old. I have no occupation. I used to be an Engineer & Carpenter. I am now unable to do any kind of (?) work. I am (?) identical Cornelius Mc Millen who enlisted as a member of Co. “C” 12th Regt Mich Vol in Octo (?) 1861. I was in Co. “C” for a short time & was transferred to Co. “J” same Regt. in place of John Shelby who was transferred to Co. “C”. 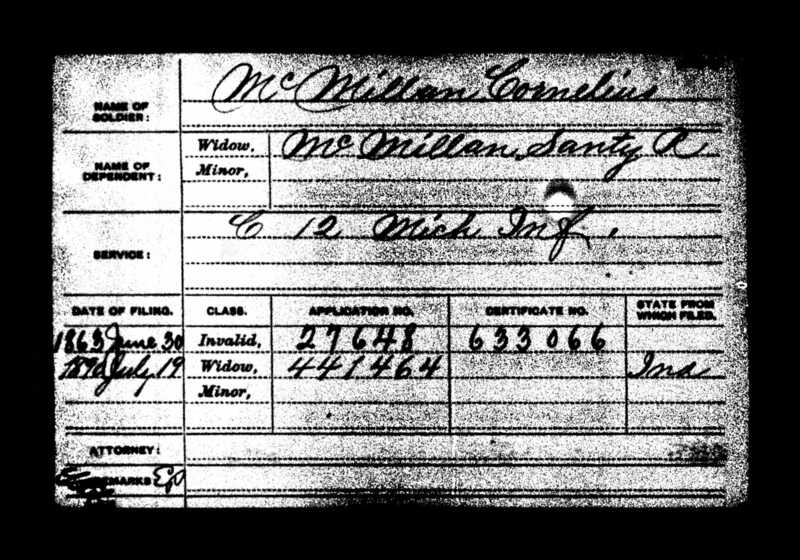 Knowing now what became of Cornelius McMillan from the time he entered the 12th Michigan Infantry until his death, let’s roll back the time to the era before Lincoln’s War to determine what can be discovered about Cornelius. The first census before the war was the 1860 US Census. Cornelius is found living in Watervliet Township, Berrien County, Michigan. 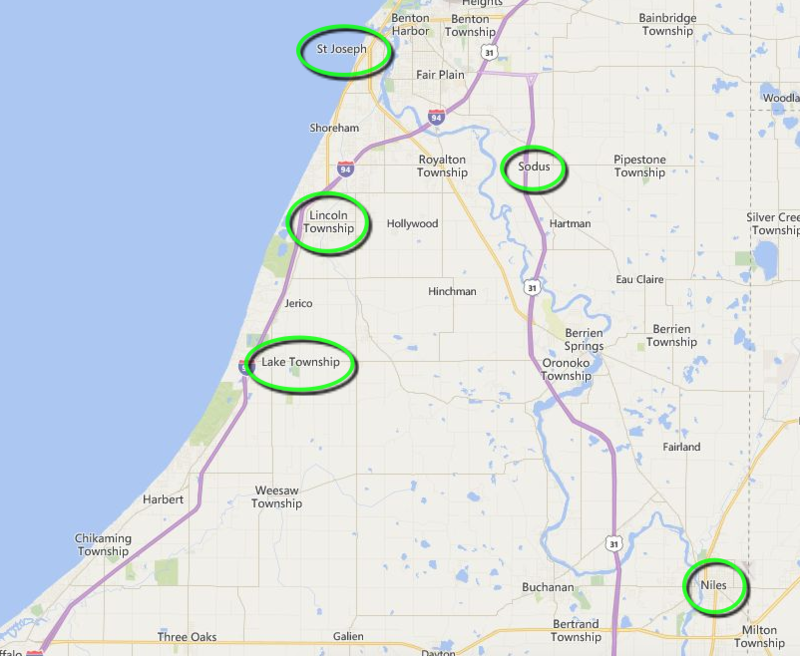 Watervliet is NE of both Benton Harbor and St. Joseph where we find Cornelius after the war. Cornelius was then living with the Elias Turrell family and works as a boatbuilder. 1860. US Census – Watervliet Township, Berrien County, Michigan. Cornelius was living in Berrien County in 1860. He is found in the Turrell household and fits the right age. What brought Cornelius to Berrien County? Where were his parents John McMillan and Sophia Bowles? 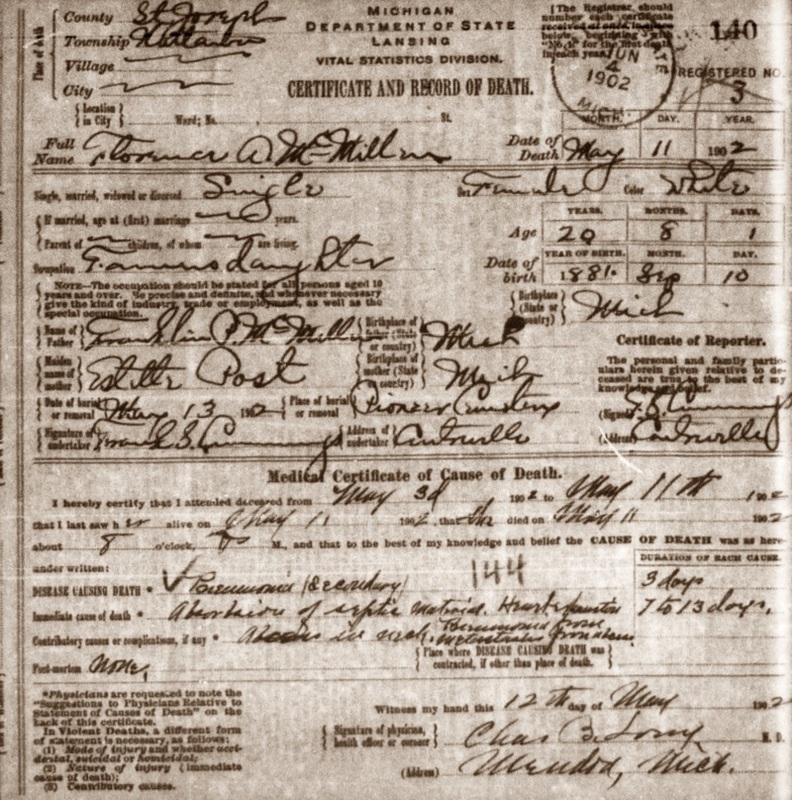 “United States Census, 1860”, database with images, FamilySearch(https://familysearch.org/ark:/61903/1:1:MWDN-K8T : 14 December 2017), Cornelius Mc Mellen in entry for Elias D Turrell, 1860. 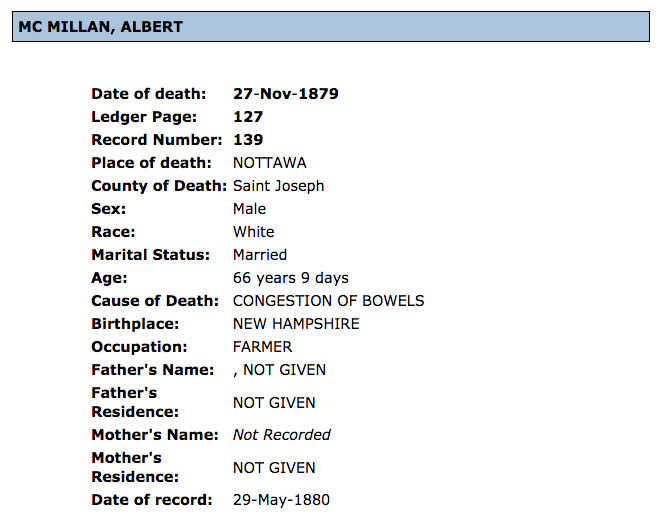 On the very same 1860 Census living in the same township as Cornelius is a man named John McMellen. John is a ship carpenter. He lives with the Charles Hibbard family (an Engineer), is 58 years old (born 1802), and was born in New Hampshire. John appears on page 19; Cornelius on page 16. It is extremely likely that this John McMillan is the father of Cornelius. John would have been 32 when Cornelius was born. Where was Sophia Bowles, John’s wife? Was she then deceased?? “United States Census, 1860”, database with images, FamilySearch(https://familysearch.org/ark:/61903/1:1:MWDN-KRR : 14 December 2017), John Mc Mellen in entry for Charles R Hibbard, 1860. That this John McMillan is connected to the previous is evident by the name of the boat, “The Pilot”. The article dated 25 years earlier places John in Berrien County and possibly in Branch County where Coldwater resides. Detailed information is given about “The Pilot” and how John McMillan, the builder, stood alone on deck while the supports were removed and the boat eased into the water. He must have been very good at his craft – and likely taught his son all he knew. “The Pilot” was 90 feet long and held 160 people at its launch. But what additional information can be picked from this article about John. 1) John held title of Esquire. This does not mean he was a lawyer, as this term is later used to represent here in the States. In English circles this was a title of respect. 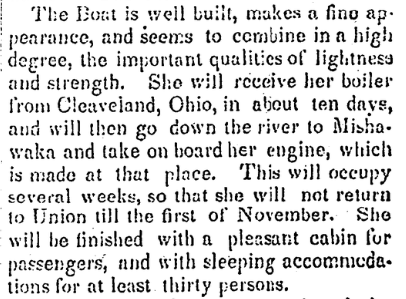 2) John built the steamship “Pilot” in Union City, Branch County (1845). containing 42 acres and 37/100s of an acre. 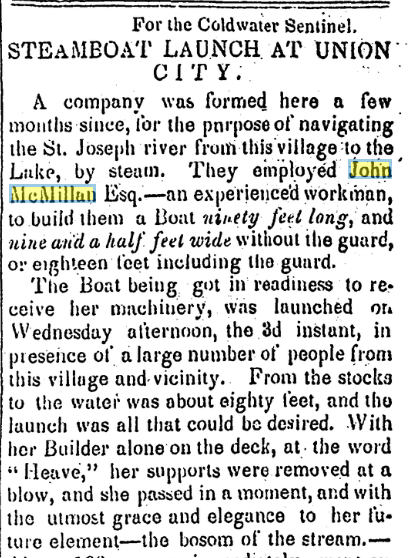 That John McMillan is mentioned in the History of St. Joseph County, Michigan as operating a ship-yard is a direct parallel to what we know about John from preceding information. 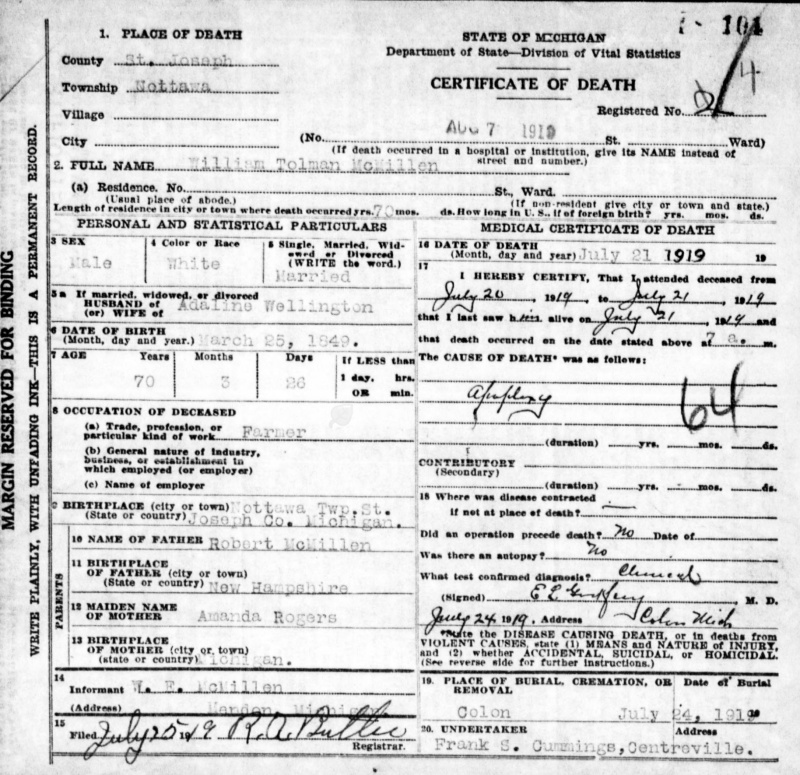 This serves to identify this John, the one of St. Joseph County, as the John who was the ship-builder and Captain in Berrien County of later years, where Cornelius McMellen also resided. That he is mentioned as being present here in the late 1930s, it is possible that he would appear in the 1840 Census for Constantine, St. Joseph, Michigan. And that is precisely where he is found. 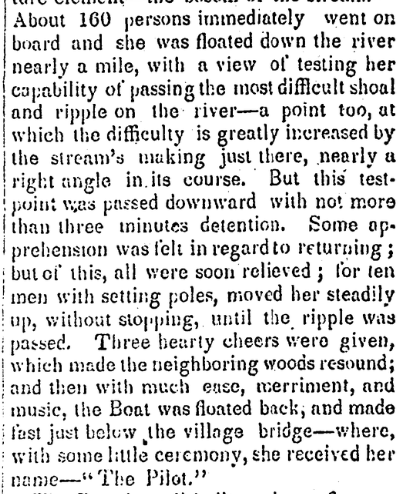 The following paragraph was found on pg117 of the History of St. Joseph County, Michigan written by L H Everts & Company and published in 1877.